The Marine Midland Bank building. Image Credit: LPC. Preservationists turned out to support designation of mid-century modern bank building. On April 2, 2013 and May 14, 2013, the Landmarks Preservation Commission heard testimony on the potential designation of the Marine Midland Bank building at 140 Broadway in Manhattan’s Financial District. The building was designed by the Gordon Bunshaft-helmed firm of Skidmore, Owings & Merrill, and exemplifies mid-century modernism in its unadorned curtain walls of black aluminum and bronze-tinted glass, and trapezoidal form. The building is offset by a sculpture by artist Isamu Noguchi, a 28-foot-tall red cube balanced on a corner. The building primarily housed financial-services industry offices, and was named for one of its principal tenants, the Marine Midland Grace Trust Company. As of 2010, the primary building tenant is Brown Brothers Harriman. The 49-story structure was calendared by Landmarks on November 20, 2012. (See CityLand coverage here). 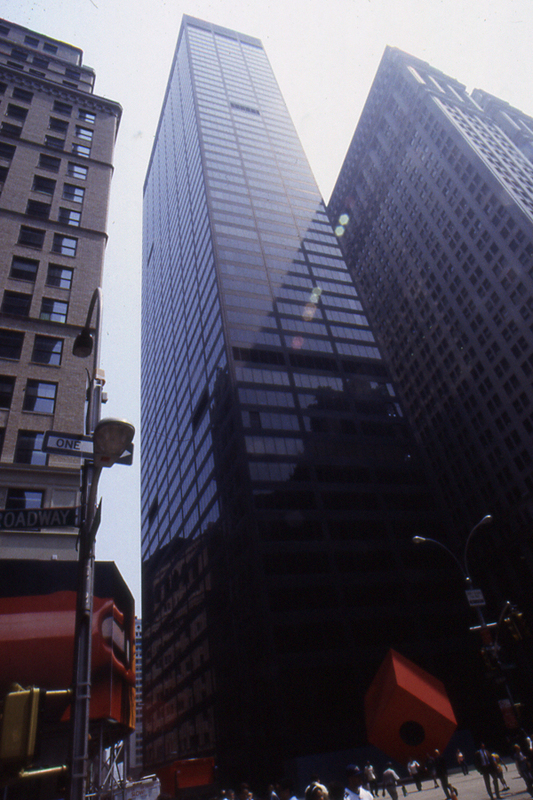 On April 2, 2013, supporters of designation included the Historic Districts Council’s Nadezhda Williams, who noted that the tower was one of the first tall structures to be built under the 1961 zoning resolution, and that its design was “almost the definition of minimalism.” John Arbuckle, of Docomomo, an organization that advocates for modern movement architecture, stated that “the public sidewalks along all four sides…allow its crisply geometrical volume to be appreciated as an elegant freestanding structure.” Andrea Goldwyn, from the New York Landmarks Conservancy also testified on behalf of designation, and New York University Professor Carol Krinsky submitted a written statement which called the building’s architecture “unprecedented at the time of its construction.” Fried Frank attorney Carol Rosenthal asked Landmarks not to close the hearing, but reopen it a later so that the owners might offer testimony. Chair Robert B. Tierney agreed. Chair Tierney said he also looked forward to a productive relationship with the building’s owners, and said he deeply appreciated “the attitude and approach” of the representatives who testified. The hearing was closed but no date has been set for a vote on designation. Update (6/26/13): At its June 25, 2013 meeting, Landmarks voted in favor of designating the Marine Midland Bank. Commissioner Libby Ryan said “not only is it an incredible building,” but its setting in the plaza was an important part of its significance, and Landmarks must “ensure that it stays that way.” Commissioner Michael Devonshire praised the building’s “sober elegance.” Commissioner Margery Perlmutter found the bank building to be one of the “icons” of mid-century Modernist tower architecture, along with the Seagram Building and Lever House. Commissioners voted unanimously to designate the building. LPC: The Marine Midland Bank Building, 140 Broadway, Manhattan (LP-2533) (April 2, 2013; May 14, 2013).